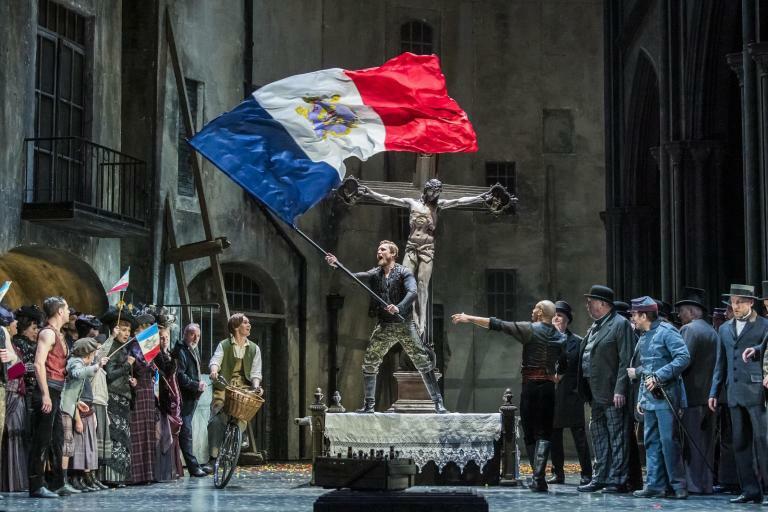 This was my first encounter in recent years with something Palace Opera have put on and they have – as their publicity suggests – a distinguished history staging opera ‘in London, Edinburgh, and theatres around the country on tour, rapidly garnering positive reactions from both audiences and critics’. There have been productions, amongst others, of Falstaff, The Marriage of Figaro, Dido and Aeneas and Hansel and Gretel. Jonathan Finney has been music director for most of their productions, and after a hiatus of activity, he has rejuvenated New Palace Opera, as it is now called. Before leaving for this concert I heard on Classic FM a recording of the Prelude from Tristan und Isolde with the Vienna Philharmonic Orchestra under Christian Thielemann, one of the finest Wagner conductors of this generation. Despite the orchestra listed as over 70, I had this performance in my mind as I took my seat in Waterloo’s St. John’s Church and Jonathan Finney picked up the baton. To be honest I believed there was little chance I would hear anything as good as that from them, yet my expectations were to be pleasantly confounded. What a surprise that this ad hoc Palace Opera ensemble produced some of the best Wagner I have heard during similar performances (Grange Park Opera, Longborough, Saffron Opera and Rehearsal Orchestra)! They displayed a deep understanding of the music and some remarkable virtuosity. The horns were formidably solid – a rarity recently – and this complemented the lean, disciplined, strings and the woodwind who together underpinned all the unfolding danger and eroticism. Remarkably few – if any – mistakes were heard from the musicians, even in their most exposed moments. Wagner’s music cannot be prominent in their repertories, but Finney – whose conducting style is quite dynamic – led the orchestral players in a performance that articulated the textures of the score with a clarity that was astonishing. Drawing inspiration from his unhappy marriage and infatuation with Mathilde Wesendonck, Wagner composed music for Tristan und Isolde which stimulates a visceral connection in the listener through its pulsing sensual energy, desire, resentment, betrayal, and pathos. The ‘Tristan chord’ – even after all the intervening years – is still regarded as one of the most distinctive and ground-breaking sounds in all Western classical music. Its mood of dramatic ambiguity sets the scene for all that follows, whether in the entire opera or the excerpts performed by New Palace Opera. Finney moulded the passionate ebb and flow of the Tristan Prelude and the Liebestod warmly, with its final bars being suitably transcendental. In between Finney’s cajoling of his players paid dividends in evoking the anxiety and eventual consummation of the lovers as their duet rose unrestrainedly towards its ecstatic climax. In moments when the music does slow down – such as for ‘O sink hernieder’ – Finney was able point up the beauty of those passages, as well as, showcase his valiant soloists to better effect. Considering how nearly impossible the principal roles in Tristan are to cast even on the international opera scene, Palace Opera’s soloists – like the musicians of the orchestra – held nothing back and no one ‘let the side down’. We also heard a couple of standout performances. Certainly, it is not rare these days to hear a Brangäne who as the maid is worthy of her mistress. Although Mae Heydorn’s mezzo is dark-hued and plangent, it is so wonderfully projected and reliable that I could imagine her singing Isolde one day. Her fine performance of Brangäne’s Watch (‘Einsam wachend in der Nacht’) and cries of ‘Habet Acht!’ were imbued with a deep foreboding which resonated throughout the church from the organ loft at the rear. King Marke’s monologue often seems to halt the progress of the drama, but as sung by the vastly experienced Julian Close it proved the emotional highpoint of all we heard. His deep voice was extraordinarily handsome, and the abiding decency of the character he created – and his obvious engagement with the King’s innate decency – elicited sympathy for Marke’s despair. The tenderness Close brought to describing Isolde as ‘Dies wundervolle Weib’ was heartbreaking and throughout he gave an immensely moving and dignified performance. Peter Relton made much of the little Wagner gives Melot in this act and although – after the impact of ‘Das sollst du, Herr, mir sagen’ – his role was brief his menace was still all-pervading. Earlier Relton had sung the Act I sailor’s song at the conclusion to the Prelude very plaintively. It was Edward Hughes and Zoe South who were facing the biggest challenges as Tristan and Isolde and they both did very well without suggesting these are roles they will be singing much of in the future. Some of their best moments were when launching their lyrical love duet and when singing together ‘selbst dann bin ich die Welt’ it brought the great sense of release it always should. Similarly, their unison ‘O ew’ge Nacht, süsse Nacht! Hehr erhab’ne Liebesnacht!’ was ardently rendered. South was at her best when she could give full value to rock-solid, pitch perfect top notes. Hughes excelled in the final minutes of the act with his mellifluous ‘Wohin nun Tristan scheidet, willst du, Isold’, ihm folgen?’ and his last fervently sung words ‘Wehr dich, Melot!’. This was not quite the end because Zoe South sang a profoundly moving and quietly communicative Liebestod or ‘Transfiguration’ to conclude the concert. An enthusiastic member of the audience leapt to his feet in front of me to loudly shout out repeatedly ‘Unglaublich!’. I suppose considering what I was expecting when I sat down ‘incredible’ was perhaps the right word for what Jonathan Finney, his singers and his orchestra had achieved. For more about New Palace Opera click here.